College Student On A Budget? 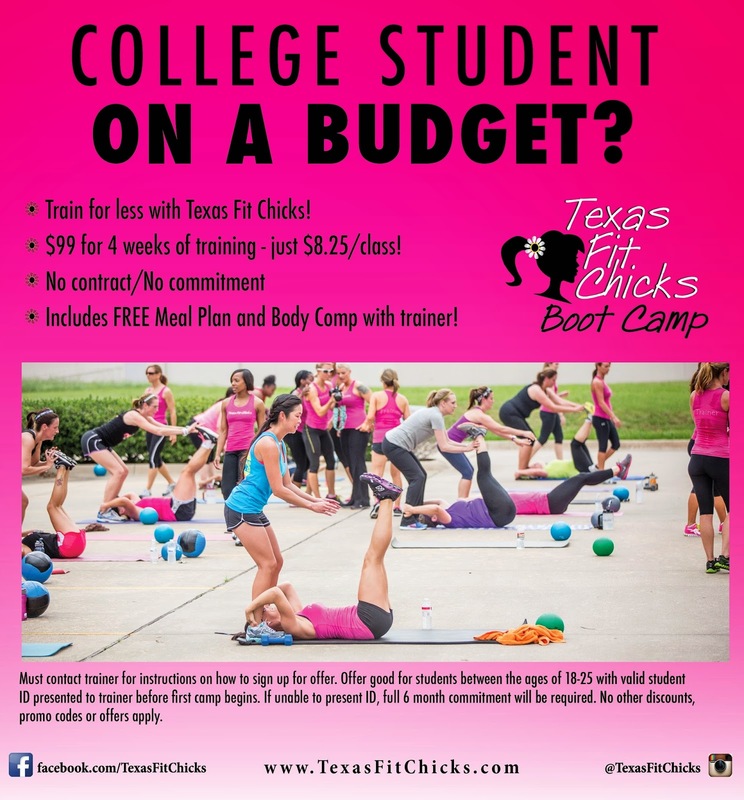 Texas Fit Chicks has a deal for YOU!! Must contact trainer for instructions on how to sign up for offer. Offer good for students between the ages of 18-25 with valid student ID presented to trainer before first camp begins. If unable to present ID, full 6 month commitment will be required. No other discounts, promo codes or offers apply. Ready to enroll? Visit our website, www.texasfitchicks.com and click on "Locations" ~ select your market and find the camp you want to train with. Click on "Sign Up" and select the "Commit to be FIT" package. Once you present your student ID on your first day of camp, your credit card will not be charged again beyond the first $99. We create a fun environment for women to lose weight and get FIT! With over 125 camp times and locations across the state of Texas, we are the leader in womens' fitness. Our trainers are all (female) nationally certified and have a true passion for helping other women GET fit or STAY fit! Designed to be modified for all ages and levels of fitness, Texas Fit Chicks Boot Camp will change the way you look at fitness and yourself! We think every woman should have access to a trainer, at an affordable price. We believe that there is no need to yell, scream or intimidate women into working out and pushing themselves. Our trainers encourage you to push to the next level in a safe and effective way. You won't ever get bored or do the same workout twice! We have many clients that have been with us since we started, in 2009. Our program is designed to dramatically change the way you look and feel in as little as 4 weeks. Our workouts and female fitness experts can help you reach your goals, in a healthy, sustainable way. Texas Fit Chicks includes a full body composition from your trainer before and after your session, and a free meal plan from a nutritionist to maximize your boot camp results. This plan includes family friendly recipes and printable grocery lists to make healthy eating simple.